Compact & Convenient Garden Soil- Our premium coconut fiber potting soil is dehydrated and conveniently packed for easy storage. When ready to use, just soak the coco coir brick in water and it will effortlessly expand to 20 gallons worth of fresh potting soil. Adding this coconut coir mix to you gardening routine will make it thrive even more. Versatile Uses. Coco Peat is capable of satisfying a wide range of needs. Husk-fibers, derived from t he shells of coconuts make this mulch durable enough to use in landscaping, garden beds or grow bags but remains gentle enough to use with orchids and other potted plants! You can even add peat moss if you want to make it a mix of coir and peat moss. Great for All Plants. Made of high-quality material, this mulch blends well with soil or fertilizer, making it great addition to any farming and gardening care routine. 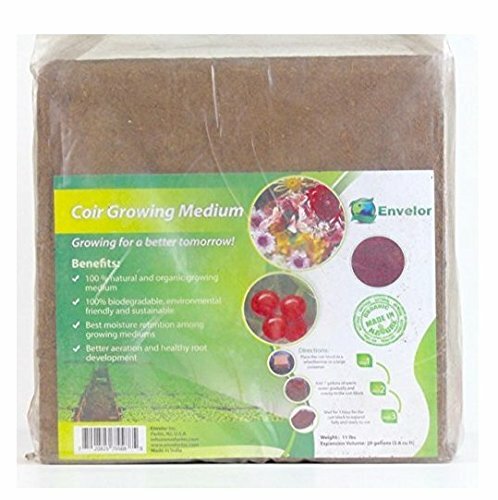 The combined benefits of low natural salt content, a balanced pH, and minimal odor makes this coco coir medium a perfect way to stimulate healthy growth for all plants! Helps Conserve Water. The lightweight fibers and coir pith particles of this excellent mulch allow for proper aeration to plants and roots, producing a more even and beneficial water flow. Its abundant water capacity and increased moisture retention allow for a more even distribution of water to roots, meaning plants will need to be watered less often! Happy Customers. Our first priority is the happiness of our customers, and we believe in creating and selling the highest quality of products. If for any reason you have any issue with your purchase, our customer service team will gladly take care of it. If you have any questions about this product by Envelor Home and Garden, contact us by completing and submitting the form below. If you are looking for a specif part number, please include it with your message.